Grilled shrimp summer salad is loaded with protein, antioxidants and summer produce that will quickly become a summer meal staple! The grill is my kitchen during the spring and summer seasons. Grilling is a straightforward process -- it’s easy and quick. Plus who wouldn’t want to be outside with sun rays and the amazing aroma of grilled food in the air? That’s why this grilled shrimp summer salad has been playing on repeat all summer long! When my husband and I come home after our evening workout, we usually just want to eat something light yet nutrient dense to replenish our bodies, but we don’t want to be slaving away in the kitchen while we are starving! A salad is a perfect solution to this dilemma. What’s great about salads is that they are versatile so even if you do not have all the ingredients or the produce is no longer in season, you can add whatever you like. Aside from the grilled shrimp, this recipe has three components: pineapple salsa, blueberries, and basil vinaigrette. So, for example, if pineapples are not in season, use another fruit like peaches or oranges. 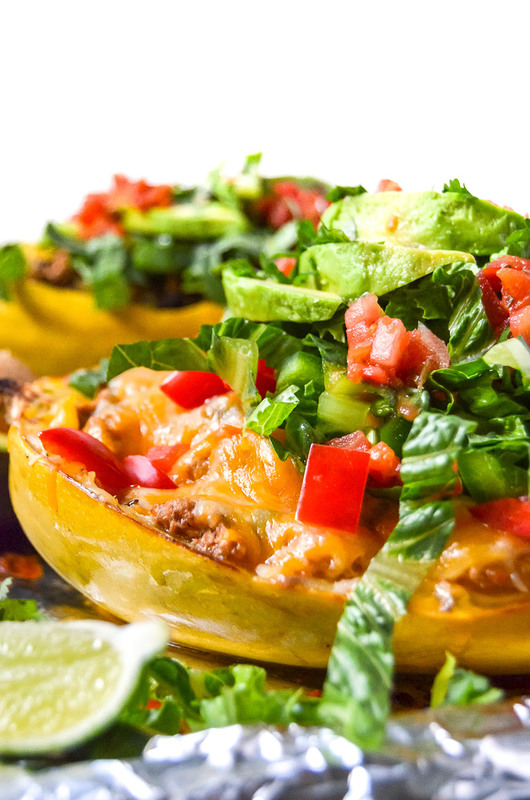 Have fun with the ingredients and customize this salad to YOUR preference! Another great thing about salads is that if you make everything in bulk then it just takes minutes to prepare a salad each night. Just put everything in containers and add/take away things to your salad depending on what mood you are in! Combine shrimp, seasonings, lemon, and oil to a Ziploc bag-making sure the shrimp is fully covered. Refrigerate for at least 30 minutes. Meanwhile, soak 6-10 small skewers in water. From the shrimp from the fridge and thread 6-8 shrimp on each damp skewer. Very lightly brush a cast iron griddle or grill grate with oil. Heat the grill to medium. Grill the shrimp for 5-7 minutes, turning over once halfway through. Place the shrimp skewers on a plate to cool. Sprinkle additional red pepper flakes if you like! Finely dice all ingredients and in a bowl, combine all ingredients. Store in fridge until ready to use. Put all ingredients in a blender or food processor and blend until smooth and creamy. Add additional oil or water if the mixture is too thick. * Due to the natural pectin found in the blueberries, this dressing will quickly begin to gel. Use immediately or blend in additional liquid to make it pourable. 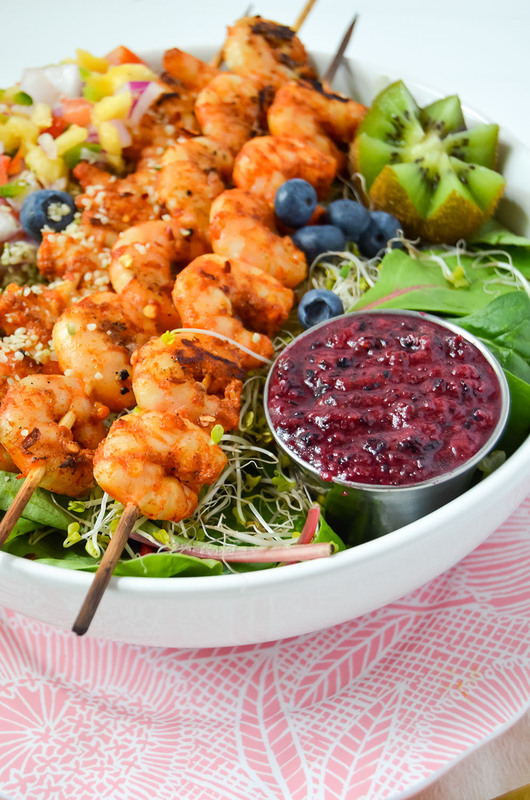 Prepare your salad by adding greens, alfalfa sprouts, grilled shrimp skewers, pineapple salsa, vinaigrette and your favorite toppings! Enjoy! Pecan crusted spiced salmon is loaded with flavor, juicy and oh so tasty! This salmon is great for a quick dinner or lunch meal prep! Ever since Katie Lee from the Kitchen on Food Network made brown sugar spiced salmon, I have been obsessed with the concept! The salmon looks professional and complex yet super easy to make. The only thing stopping me from eating it so much is that it calls for ½ cup of brown sugar! That’s why I recreated this recipe using coconut sugar instead of brown sugar while also adding pecans for texture and crunch. I usually pair the salmon with sweet potatoes because the caramelized pecans complement the flavor and texture of the sweet potato. It’s also great to make this for lunch or for your meal prep as the dish is filled with healthy fats, protein, and complex carbohydrates to keep you satisfied and full of energy! If you are incorporating this recipe into your meal prep, I would recommend eating the salmon at least two days after it has been cooked. If you are anything like me, I like to have my salmon cooked on the raw side so fewer days in the fridge is best! To make this into a lunch/dinner meal prep: simply boil two peeled sweet potatoes until mushy. Add salt and pepper to your potatoes. Next, saute the rest of your vegetables until halfway cooked through with salt and pepper. Assemble by adding mashed sweet potatoes, vegetables and salmon on top. Enjoy! Sprinkle seasonings on the pink side of the salmon. Add oil to a pan on medium-high heat. When hot, place seasoning side down on the skillet and cook for 5 minutes. Add salt and pepper to season the skin part of the salmon and flip. Mix sugar and pecans and sprinkle the mixture on top of the salmon. Cover with a lid and set the temperature to low-medium and cook for 5-10 minutes or until desired pink and the sugar has melted. *If the coconut sugar has not caramelized, place the skillet in the oven with the broiler on low. Cook for 1-2 minutes but make sure you keep an eye on it! Let cool and serve with mashed sweet potatoes and steamed vegetables! No summer grill is complete without a good steak marinade and chimichurri sauce recipe! Easy, simple and super delicious! When it comes to steak, you want to think of the KISS principle (keep it simple, stupid!). When cooked right, a steak is super juicy and tender on its own with some simple salt and pepper. But to take it to the next level, well, I am all about that! Using marinades is a great way to kick up your steaks just a notch. This simple marinade infuses the steak with tons of flavor. Lime juice is used to break down the toughness of the meat while the garlic brings out the flavor. I highly recommend marinating the steak overnight but if you are pushed for time, 30 minutes should suffice. For this recipe, I used strip steak, but you can also use different cuts of steak like a skirt steak for instance. My favorite way to cook a steak is on the grill (is there a better way!?). I like to set my grill over medium-high heat and cook each side for just 5 minutes to get a nice sear and to achieve the rare to medium-rare pinkness. You could also cook in a skillet if you do not have access to a grill. You could stop after grilling your steak, but wouldn’t you like to go an extra step? If you are interested in adding some green to your steak, try out adding a chimichurri sauce! Since you are marinating the steak with subtle ingredients, the sauce really takes the steak to the next level! Everyday herbs like cilantro and parsley are used to provide a fresh clean flavor to the steak. The sauce is super easy to make with just a processor or blender. You could also use this sauce on different types of dishes like eggs, chicken, or used in pasta salad dishes. Coat the steak with salt and pepper on each side. Whisk the garlic, lime, and EVOO together and pour into the Ziploc bag. Add the steak to the bag and marinate for at least 30 minutes or overnight preferably. Grill on medium-high heat and cook for 5-10 minutes per side or until desired pinkness. Let the steak rest by placing aluminum foil over the steak for at least five minutes. Cut steak across the grain and serve with chimichurri sauce. Add all ingredients to a food processor and blend until everything is fully incorporated and smooth. Healthy baked turkey meatballs that will just melt in your mouth! Turkey meatballs are one of the easiest recipes ever! I usually end up making these when I meal prep at least a few times a month… This recipe will make about a dozen meatballs, but I usually double the recipe if I decide to meal prep. I’ll make one big ol’ batch of meatballs and I am set! You’ll see that I often choose to use ground turkey instead of beef. I prefer using ground turkey because it’s inexpensive, lean, and can be easily influenced flavor-wise based on the number of spices and herbs you put into it. Since ground turkey is naturally mild in flavor, spices and herbs are key to making a juicy and tender meatball. For this recipe, everyday spices and herbs like parsley, coriander, and ground mustard are incorporated to create a classic meatball that can be used in all kinds of recipes, whether it’s for your basic spaghetti and meatballs, or as an appetizer for a large party. I choose to bake the meatballs rather than pan fry to make them a healthier option. I also find that baking them saves me time because I don’t have to keep a close watch, endlessly worrying if I’m burning them! If you are wanting to make these turkey meatballs for your meal prep, consider adding them to 100% whole wheat pasta, bean-based pasta, or zoodles! Simply spiralize zucchini to create noodles, add your meatballs, and top it all off with some organic no-sugar-added pasta sauce and cooked mushrooms. Before I seal my meal prep containers, I like to sprinkle some nutritional yeast on top to provide a cheesy flavor component! Make sure each meatball are equal in size to ensure they cook evenly. Fresh herbs are best! Using dry parsley will not provide the same amount of flavor compared to fresh parsley; trust me, it’s a game changer! Don’t overmix! Since ground turkey is a leaner meat, overmixing your ingredients can make the meatballs tough. I prefer using my hands to mix the ingredients. Want to make these turkey meatballs ahead of time for an event? Freeze them! To freeze the turkey meatballs, follow the recipe as normal and then let them cool. Once cooled, add meatballs to a freezer Ziploc bag and store them in the freezer for up to one month. You can thaw them by moving them to the refrigerator. You could reheat the meatballs by microwave, but I prefer using the oven by setting it to 375 degrees and baking the meatballs for about 15 to 20 minutes. Place coconut oil in a skillet over medium-high heat. Cook garlic and onions until aromatic and the onions are translucent. Place all the ingredients into a large bowl along with the cooked onions and garlic. Using your hands, mix ingredients until fully incorporated but remember to not overmix. Form meatball mixture into golf-sized balls. You can use a cookie scooper to help you measure out the mixture. Line a baking sheet with parchment paper and place meatballs on top. Bake for 25-30 minutes and then flip them for an additional 10 minutes or until fully cooked, reaching an internal temperature of 165 degrees. This recipe makes about 12-16 meatballs. Consider doubling the recipe if you are meal prepping!